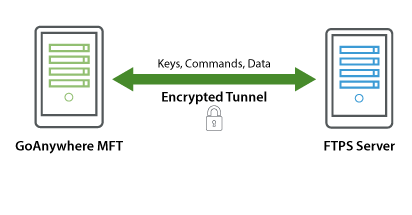 Learn how an FTPS protocol client is supported by GoAnywhere MFT to secure data transmissions across your enterprise. For organizations who need to secure file transfers with trading partners and enterprise servers, GoAnywhere MFT allows the use of FTPS (FTP over SSL/TLS) protocol. Passwords, client certificates, and server certificates are supported for authentication. GoAnywhere MFT will help guarantee delivery of FTPS transfers with options to auto-retry connections, auto-resume interrupted file transfers, and perform integrity checks of successful file transfers. FTPS server connections can be pre-defined in GoAnywhere MFT's Administrator as reusable Resources which can be selected from simple drop down menus. FTPS Tasks can be placed within GoAnywhere MFT Projects and executed as part of a cohesive workflow process. For instance, a Project could be defined to retrieve records from a database file, convert the records into a CSV file, and then put the CSV file onto a FTPS server. Audit trails (logs) are generated for all FTPS transmissions in GoAnywhere MFT to meet auditing and compliance requirements. The level of log detail can be controlled by an administrator on a per-Project basis. This detail can be configured to include all FTPS commands issued, FTPS messages and file names transferred. Log messages can additionally be sent to a Syslog server using UDP or TCP connections. A comprehensive Certificate Manager is provided in GoAnywhere MFT to allow for the management of X.509 certificates. This Certificate Manager can be used to create certificates, generate CSRs, import CA replies, import trusted certificates and view certificates. These certificates can be utilized within GoAnywhere MFT for automating FTPS and HTTPS transmissions. The Certificate Manager can also be used to export certificates for sharing with your trading partners. Request a quote to integrate with FTPS using GoAnywhere MFT.